The potatoes I didn’t plant, jumped the edge of the box, happy in the heat. The strawberries look nice, but for the first time in my gardening history, they’ve been over run by ants. Ack! I reached in for a juicy red berry and came out with a handful of swarming ants along with the fruit. When I did find an unencumbered strawberry, it looked great but tasted bland. I think this is the last season for them. My EarthBox pumpkins are growing well, but for some reason the water wicking system isn’t working. I’ve had to hand water three days in a row as they’re drooping by mid day. I may remove the compost covers tomorrow when it’s still cool and give them a long soak. I’ll let you know it that does the trick. Ever-mischievous Mouse the cat cornered an iridescent lizard on the garden path. I put Mouse in a ‘time out’ for a spell, then encouraged the tiny lizard to make haste. He was happy to oblige. 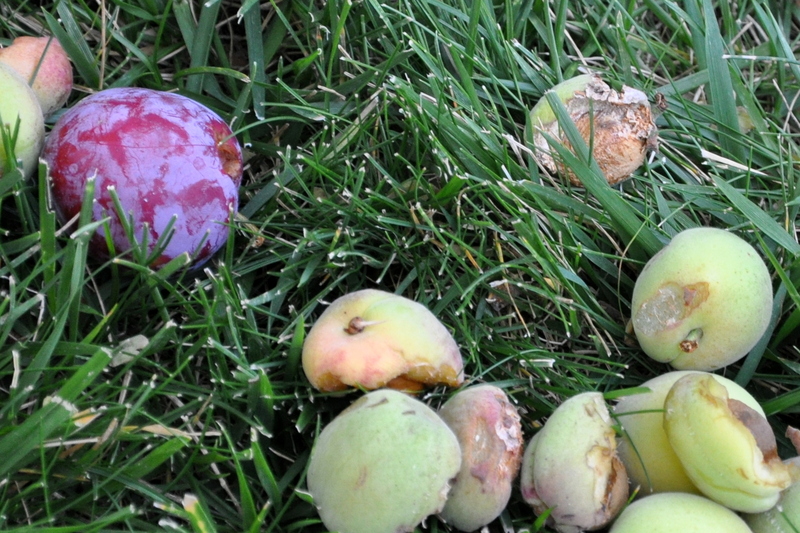 One of the squirrels dropped by and offered to sample the apricots and plums. Just a couple of bites out of each one should do it. 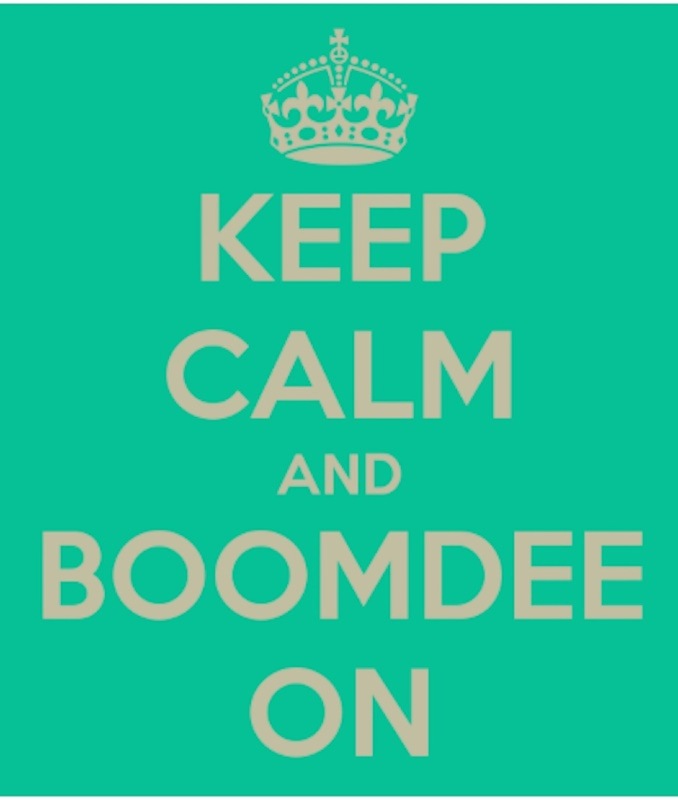 Yep, yep…carry on, carry on. Nothing to worry about here. Taste testing the fruit: we passed! I have a new theory about their bushy tails. I think that’s where they store their ego. In better news, the fruit covered in netting remains untouched. Hurray for that. Thanks for following along on my garden adventures. Your companionable comments are among the highlights of my day. 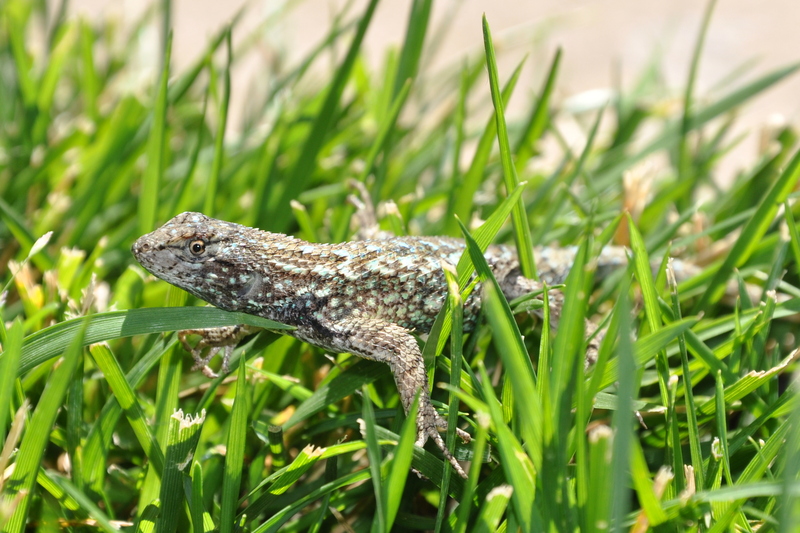 This entry was posted in Gardening and tagged california fence lizard, cats in the garden, Gardening, grey squirrels, growing fruit, growing straweberries, summer garden, Western Fence Lizard. Bookmark the permalink. Your garden is looking so lush! It’s hard to believe you have just emerged from winter ……….. oh, that’s right, I almost forgot – you didn’t have one! 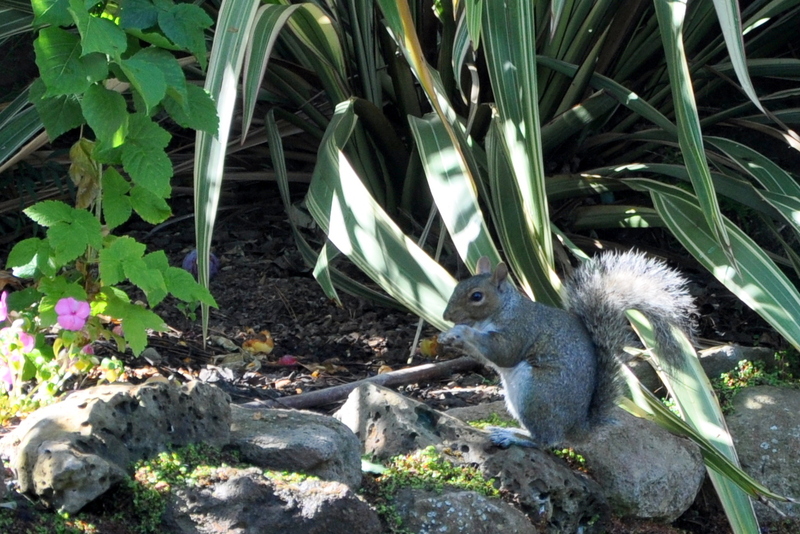 Squirrels and lizards and Mouse – all so lovely. We call them [lizards] geckos here and they were everywhere when I was a child – now I haven’t seen one in years. I love the way the squirrel taste tests – that’s what the Aussie possums that immigrated here do – except they keep testing til there is nothing left – bless ’em! 🙂 . I hope you are having a good week and that all is well with all the family. You said it…no winter to speak of. It sounds good on the surface, but I missed the changing seasons and really, really, REALLY missed the rain. In Hawaii they refer to them as geckos. They’re smaller then this lizard by about a third, and we would count them on our walks when we were there with our boys five years ago. Like you, we saw many more lizards, frogs and toads as children. I fear the population is in decline. Did the possums arrive on ships, inadvertently, or did someone introduce them on purpose for some reason? I know we’ve discussed this before but I can’t recall. The crazy thing about possums is that in Australia they are protected [dingo’s and a harsher landscape do them in] and here they are considered a pest. They breed like crazy and, with no native predators to stop their advance, thrive in our rain forest environment and destroy the habitats of our native birds and steal eggs ceaselessly – as well as stripping trees of leaves and denuding whole tracts of forest. They arrived in a variety of ways – but primarily in the 1830’s they were introduced from Tasmania [Narf77!!] for the fur trade – their pelts do make the most glorious rugs and take dyes amazingly well! In a country of 5 million people it is estimated there is probably 100 million possums. I remember when I arrived home from living in the UK, sick and exhausted with life, tucked up in the back of my friends car making the long drive from Auckland to Hawkes Bay looking out the window and seeing toi toi’s blooming and possum road kill and knowing I was safely home once more! Isn’t it odd what we remember! Thanks, Cathy. I do wonder why they don’t finish. when they’re still green I just assume that they take a bite and realize it isn’t tasty yet, but once they’re ripe, I don’t know why they don’t finish. Perhaps they just drop it and move on to what’s nearby. Admiring your garden, Alys. How wonderful it is to nurture things to growth! Can tell that even with some challenges, it’s a source of joy for you. Thank you, Linda. It certainly is. 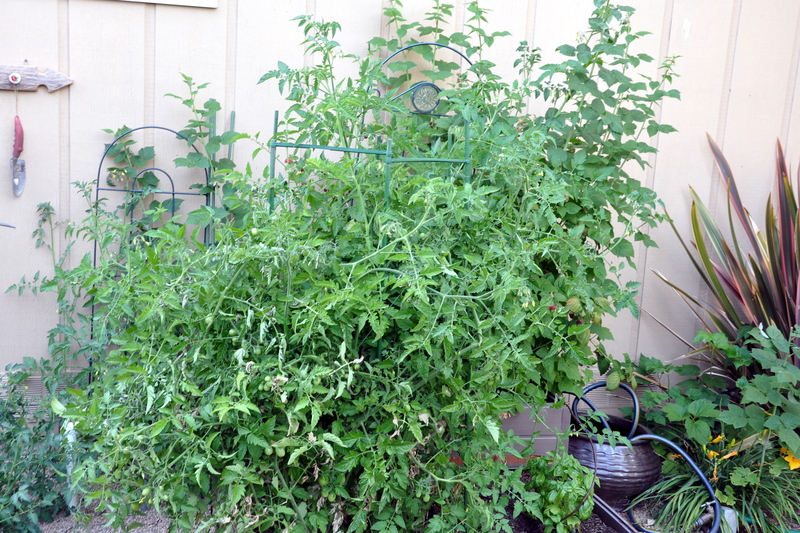 I’ve gardened my entire life, even when living in tiny apartments or renting a room. I love helping things grow and flourish, and appreciate all aspects of nature. Wonderland! That’s what it is. Everything is positively gigantic. Shame about the ants. I see them everywhere. They are making a hill in our window well at the new house. I plan to vacuum the hill and leave a bait trap there. Hopefully that will help. 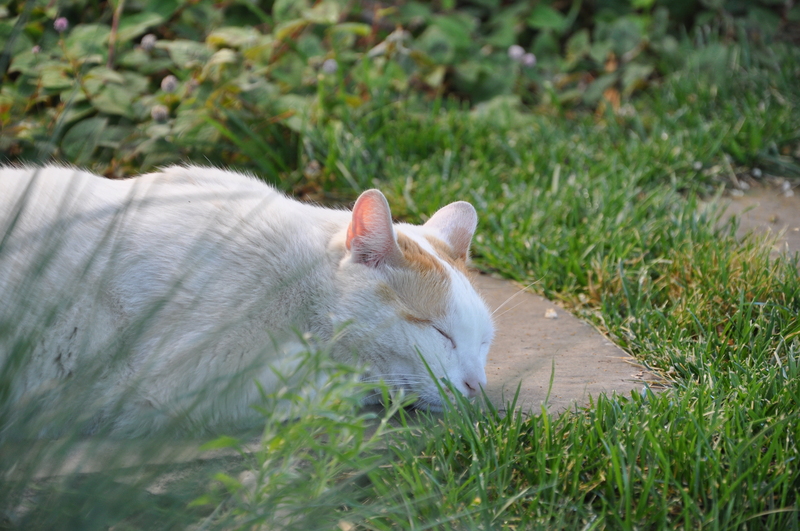 Mr Mouse looks so peaceful but how funny that he chooses to rest his widdle head on a stone instead of the nice soft grass right there. Maybe he likes the heat? Dreaming of a little lizard friend no doubt. Glad you were able to save that little guy for another day of fun in the sun. I suppose they are prey for all kinds of birds or cats. Thank you so much! We have excellent growing conditions here, so really, we have no excuse when things don’t do well. You’re right: Halloween is just 4 1/2 months away. I must keep those pumpkins going! saying 4.5 months freaks me out!!! 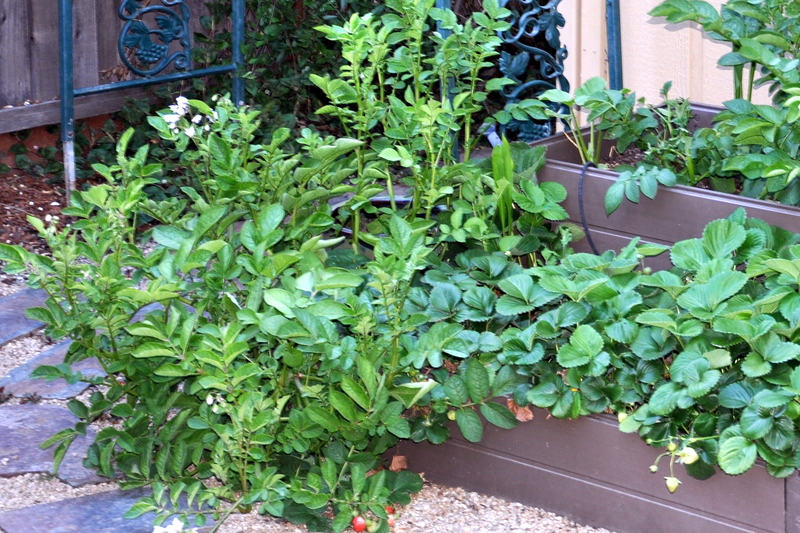 I can’t eat tomatoes and I’m not a fan of basil, but I can’t wait to try your raspberries and potatoes. Let me know when they are “ready” for consumption. I’ll be there, front and center! Sharon, I can’t wait to share them with you. You’ve always been a wiz with your soups. Perhaps you can turn some of the potatoes into a yummy concoction.